The Villages at Mauna Lani is one of the premier destinations at the Mauna Lani Resort. The low-density community is ideally situated within walking distance between the Shops at Mauna Lani and the Fairmont Orchid. The very popular Maile Villa is sprawled out with over 2,700 square feet and almost 5450 square feet of lanai pace for outdoor entertainment. 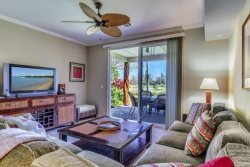 This Villages at Mauna Lani features three bedrooms, three full plus one half bathrooms and comfortably accommodates up to ten guests. Nightly rates listed are for 8 persons, each additional person will be an additional $20.00 per night, per person. There is a maximum of 10 persons, regardless of age, allowed. The main living area has an open living room with pocket sliding doors that open on to a spacious lanai with an outdoor kitchen, a built-in BBQ, and dining table for six for outdoor dining. A beautifully-appointed kitchen features cherry cabinets, granite countertops, SubZero and WOLF appliances, and all the kitchen items you need for an extended stay to feel like you are at home. There is a formal indoor dining table for eight and additional seating at the breakfast bar. Located on the main level is a beautiful and spacious master suite that features a king-sized bed, flat screen TV, and a marble bathroom with a walk-in shower and a deep soaking bathtub. The plaza level has two additional bedroom suites; one with two queen-sized beds and the other with two full beds, both with attached bathrooms and TVs. This unit also includes; basic cookware, dishware, drinkware, coffee maker, blender, washer/dryer, hairdryer, bed and bath linens, iron, air-conditioning, games, books, wireless service, basic cable TV. There is plenty of beach gear like beach chairs, boogie boards, cooler and an umbrella as well as beach towels for your use. The community pool is a great spot to soak up the Hawaiian sun and for those seeking a workout, there is a fitness room with top-of-the-line workout equipment. In addition, you and your guests will have access to the Mauna Lani Beach Club. I will be back. Loved the property. Best property that I've rented on the island. What a terrific house! It felt like home and had everything we needed for a perfect Hawaiian getaway. Everything was clean and well taken care of. I especially loved the new washer and dryer. We definitely plan on staying here again. Nightly rates listed are for 8 persons. Each additional person will be an additional $20.00 per night, per person. There is a maximum of 10 persons, regardless of age, allowed.